The good news: Bielefeld does have an IKEA. The less-good news: it’s not the easiest to get to if you don’t have a car and are new to the area. I remember that we had to search on the internet for a long time and compile information from a few different websites before we came up with a plan for how to get there using public transport. Take the number 1 tram towards Senne. Get off at Brackwede Kirche. Walk down Hauptstrasse, continuing in the same direction that the tram was going. Take the first right onto Berliner Strasse. On the right side of the street, you will see a waiting lane for buses. Hopefully yours is already there – it’s the 123 and it says IKEA on the marquee. If you’re not sure, you can always ask the driver, since “IKEA” is one of those great, internationally-recognized words. It’s a short ride there (probably less than ten minutes). You’ll get off on the same side of the street as the IKEA. To go back to town afterwards, just wait at the same bus stop, since this line runs on a loop. It’s a slightly longer ride back. It looks so easy when it’s written out in these short steps, but we had never taken the bus before and there is no way to tell where the bus stop actually is. We thought it would be right at the tram stop, but it’s actually hidden around a corner 🙂 We only went to IKEA once, on a Saturday, and it was not very crowded on the bus. I wouldn’t worry about not having room for your bags if you are planning on buying a lot. However, you can also do home delivery if you are buying larger furniture pieces. I’d recommend leaving early in the morning to allow some travel time and to avoid the crowds that only get bigger as the day goes on – the store opens at 10 am. 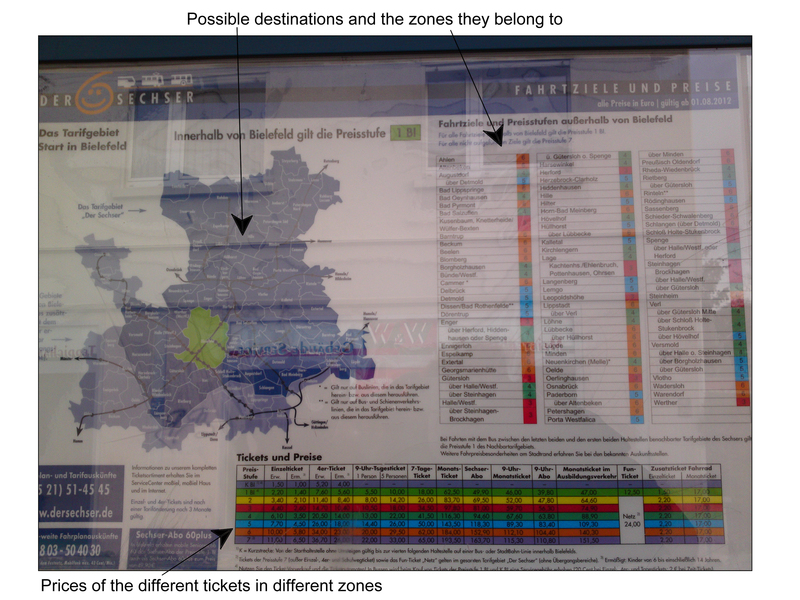 For more on how public transportation works in Bielefeld, see Reka’s recent post. Buses go everywhere in Bielefeld, they are clean and usually on time. You can get on buses at the front door, and show your ticket to the driver. There is normally at least one screen inside, that shows the next bus stops, and a voice telling the actual one. If not, the drivers are willing to help, they don’t necessarily speak english, but if you know at least the name of the bus stop, it will work. There are 4 lines in Bielefeld. They are also usually on time, and faster than buses. It’s actually a mixture of tram and metro, there are some stops underground too. All the four lines meet in the center: at Hauptbahnhof, Jahnplatz, and Rathaus you can reach them all. If you have to change between tram lines, I suggest to do it at Jahnplatz, there is only one platform, you don’t need to go anywhere, not cold, and no chance to get lost…:) They also have screens inside with the next stop and the picture of the tram-network above the doors. There are a few smaller train stations inside of Bielefeld. If you are lucky to have one close to your home/work it might be the easiest and fastest way to get somewhere. You can get for example from Bielefeld Ost to Hbf in 5 min instead of the approximately half an hour by bus and tram. But you can do it maybe only once in an hour, you can find out more about it at the office at Hbf (they speak english). With buses you can use the second (bigger) door, the driver normally pays attention to people with prams or wheelchairs. In theory you still have to go to the driver to show your ticket, but I’ve seen mums with prams only lifting up the ticket while standing at the bus stop when the bus arrives, so that the driver sees it. With trams there are some special places for prams etc., you can see a sign on the door outside. (see ’Possible problems: Tram-stairs, Crowd&pram’) And there are elevators at the underground stops. On buses there is only space for up to two prams or wheelchairs, including big suitcases and grannys with their ’cars’. So there might be a twin-pram and a granny already on the bus and you have to wait for the next bus(sometimes with 2 other prams…) If you have to be somewhere on time, count on it. On trams there is more chance to fit in, but they can also be full. I thought it’s only a problem for me (coming from Hungary), but after some international conversations it seems to be something real, and it’s also not nice to say, but better be prepared. There are prices are for different zones but the whole of Bielefeld belongs to the price-zone (Preissufe) 1, which makes things easy. You only have to think about the zones when you go outside of the city. 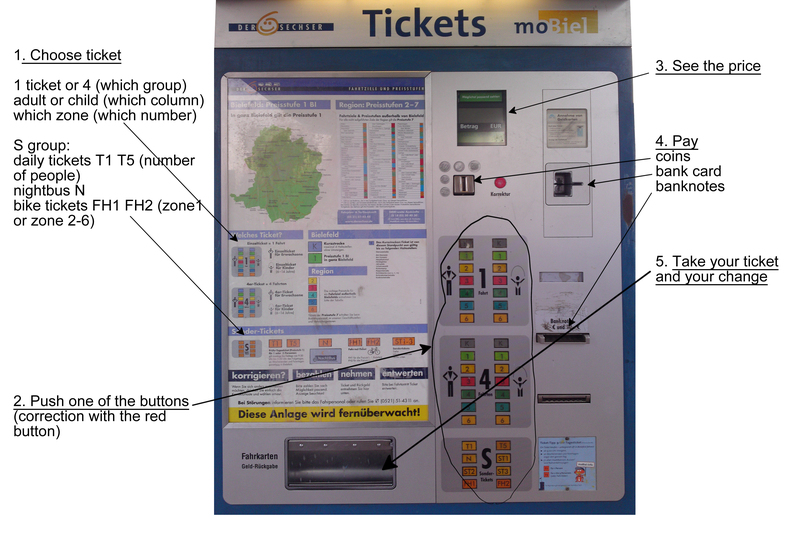 The chart with the zones, prices and all are on every ticket automat nachine. You can buy almost every kind of ticket for every zone. My pictures are taken on the 10 January 2013, they are now the actual prices, but they might change! Einzelticket – Single ticket: you can travel wherever, however, changing as many times as you want with it, (inside of the zone) for 90 minutes after stamping it. –Short ticket (Kurz) you can travel up to 4 stops, one way without changing. 4er Ticket – 4 x single ticket: Either up to 4 people or for 4 journeys. Cheaper than buying them individually. You can buy either 4 short tickets (see above) or 4 regular tickets. Single daily ticket: for 1 person for the whole day, from 9 in the morning valid from stamping. They are for your name, valid with ID, for a week/month. Monthly tickets you can also get the 9Uhr version. And the best: It’s cheaper than the normal monthly ticket, and weekdays after 7pm and all day weekends you can take one more adult and 2 children and a bike for each with you!!! I don’t know much about them, you can find out more about it at MoBiel Haus (see below) they speak english. Single, 4er, and daily tickets need to be stamped. (4er tickets once for each person, and once for each ways, 2 on the front and 2 on the back side). On buses there is an orange box for it near the driver. If you buy single ticket ticket from the driver, you don’t need to stamp it. At trams there are orange boxes at the tram stops and on the tram also, you can choose where to stamp. But if you want to travel longer with them, it’s only valid for 90 minutes, better to stamp on the tram, so you won’t lose 10-12 minutes at waiting. You can find timetables at every bus/tram/train stop. They are normally actual and useful. Important: pay attention to the little tricky signs which might be near the leaving time, and might mean either nothing to you (goes through an other street as usually, has an other number from halfway, or goes further than the end station) or something very very important (goes only till halfway or doesn’t stop in your bus stop or working only on fridays). If you don’t know what does it mean, better try to ask someone there or the driver (works only by telling the driver the name of the bus stop, and getting the answer: ’ja’ or ’nein’), I had already some unpleasant surprises. You can have your own copy also. For all the tram and some of the bus timetables you can simply take from the office at Jahnplatz. But you can ask for every bus or tram timetable, not only the general, but the one-for-your-bus-stop version at MoBiel Haus (see above). They are simply printing them for you. You can find everything at mobiel.de but of course it’s in german. For timetables on the homepage click on ’Auskunft’ on the blue line, then click on ’Fahrplanbuch’ on the list on the left side. It will give you the list of all the tram and bus lines both directions. There is also a journey planner which can show you the best route to your destination. If you’re not European, it’s likely that your new home in Bielefeld will come with a learning curve when it comes to using public transportation. I was not used to being without a personal car, or riding the bus, and I had never been on a train before! German public transportation is excellent, and while it is more expensive than other places in Europe, it is perfectly possible to live without a car here (and we do). Like many things in Germany, things often run like a well-oiled machine, but it is not likely that anyone will tell you how that well-oiled machine actually works….well we will! NRW ticket- This ticket allows you unlimited travel in the entire state of North-Rhine Westphalia from 9am until 3am the following day. It is good for all regional trains (NOT the IC or ICE), all trams, and also buses. The cost for one person is 26€, or you can buy an NRW ticket that is good for up to 5 people for 36€ (this may change). This is usually the cheapest way to get from Bielefeld to the Dusseldorf airport, or to Cologne. Important: the ticket is NOT good before 9am on weekdays! This ticket is particularly useful for a day trip to tour a city. For example, you can go to Cologne on the train, and sightsee all day on trams and buses, and then come back by train, all with this one ticket. Although the NRW ticket is only good within our state, every German state has their own state ticket. This is often a good option if you are visiting a city as a tourist and want to see as much as possible in one day. Keep in mind that two popular cities, Bremen and Berlin, are their own city-states. Schönes Wochenende (good weekend) ticket- This ticket allows up to 5 people unlimited travel anywhere in Germany for one day, on either Saturday or Sunday. The ticket costs 40€ when you buy it online. It is good from midnight until 3am the following day (27 hours). It cannot be used on weekdays, and like the NRW ticket it can only be used on regional transport (NOT the IC or the ICE trains). It is also good for trams and buses. This ticket is a good option if you are sightseeing in another state. If you are travelling a long distance, however, it can take quite a long time because you are not allowed to take the fast trains. If you don’t frequently ride the buses and trams, the cheapest option is buying 4-er tickets. Each ticket can be stamped 4 times. Bus tickets can be bought from the bus drivers, but they cost less if you buy them from the electronic machines, which are located at all of the tram stops. They can be confusing! To buy a 4-er ticket for Bielefeld, press the green “1” button next to the image of 4 people. Do not press the “4” button, this means region 4! Stamping a ticket once will allow you to travel all the way to your destination, even if you must change trams or buses. The stamp stays valid for 90 minutes, and you can travel as much as you want to during that time. You can also buy week or month tickets, which allow you unlimited rides. There is also a specific month ticket which allows one person unlimited travel, and an additional person can ride with you after 19:00 on weekdays and all day on weekends. These tickets can be purchased from the Mobiel office underground at the Jahnplatz. There is no difference between tram and bus tickets. You can use all tickets for both. If you do not have a car here in Bielefeld, it is nice to still have the ability to occasionally use one, for example when you go grocery shopping and cannot carry everything on the bus. Bielefeld has a number of ordinary car rental places, but there is also the option of car sharing. Cambio offers a service in which rental cars are parked strategically around town (mostly near tram stops), and members can simply reserve one of the cars for a period of time, and then bring it back to the same place. Everything is automated- once you become a member, you can reserve cars online in seconds, and then type your member number into the electronic box next to the car to pick up your key. Several options are available for membership, depending on how often you plan on renting a car. Members pay a small monthly fee, a flat rate per hour, and per kilometer usage. An average cost might be around 10€ per hour. A gas card is kept in the car in case you need to refuel, and members do not pay anything for gas. You must have a valid European driver’s license to register. International and foreign driver licenses are usually recognized for the first 6 months. After that, you must obtain a European license. An extension can be made if you are staying in Germany for less than one year, but you must prove this with paperwork. Licenses from all EU member countries are recognized without time limitations, and there is no need to change your license.